The action has been heating up for Spider-Man for some time now. Over the course of his long run with scribe Dan Slott, the wall-crawler’s story has left behind a few loose threads of webbing which are finally being pulled together in Amazing Spider-Man #18. One of the most intriguing arcs in the last few years was Superior Spider-Man, in which Doctor Octopus usurped Peter Parker’s body. In an attempt to be a true hero, the now-good Doctor Otto Octavius makes the ultimate sacrifice to save lives. Yet that’s not quite the end of the story. Spidey’s latest adventure, Amazing Spider-Man #18, written by Dan Slott with fill-in artist RB Silva, picks up after the unfortunate events of #17 – which killed off Spider-friend Prowler (aka Hobie Brown) and rebooted Max Dillon’s Electro as his ex-girlfriend Francine – as well as giving further insight into the Jackal’s cloning process at his '"medical company," New U. The pages of Spider-Man’s past continue to haunt him, as it appears Otto Octavius is, despite his limited capacity, still very much a threat. Way back when (2014, that is), during the Spider-verse event cleverly titled "Spider-Verse," Superior Spider-Man is pulled from his own dimension into the year 2099. As ASM #18 explains, the pre-heroic Doc Ock winds up using the technology to record an electronic imprint of his mind (shades of Star Trek: The Next Generation’s ‘The Schizoid Man’) and send it back in time. Throughout the issue, Octavius masquerades as Parker’s helper-bot Living Brain, which leads to some humorous and surprisingly deep moments for the oft-villain, especially when trapped inside his mechanical body next to his ex, Anna Maria Marconi. After the tragicomic end of Living Brain, we once again see Octavius’ futuristic octobot scrambling from the rubble to start his own investigation into New U. 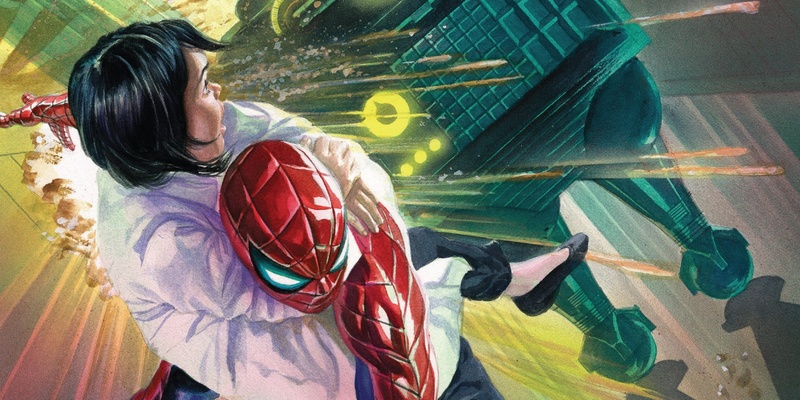 While it’s generally light on action and heavy on exposition (which, when well-written, works just fine for Spidey’s adventures), the connective tissues for the upcoming Clone Conspiracy event are beginning to pull together. Once Octavius uncovers New U and his old "colleague" of sorts behind the scenes, it sounds like he’ll be ready to rock with a new body and a new lease on supervillain life, including proving his worth to his former flame. After all, everyone knew Doctor Octopus wouldn’t stay dead for too long. He’s just too much fun as a foil for Spider-Man's antics. As witnessed in ASM #17, though, clone life doesn’t come without its price. Unless Doc Ock manages to strike a bargain or coerce the Jackal, he’ll probably wind up under his thumb. Octavius is a smart cookie (a fact he certainly likes to remind everyone about), though, and won’t likely agree to anything without a backup plan or devious double-cross in mind. Still, the question remains as to whether he'll choose to sport his classic body or disguise himself as Peter Parker to confuse everything and woo Anna Maria. Amazing Spider-Man #18 is currently available. Amazing Spider-Man #19 arrives on October 5. Dead No More: The Clone Conspiracy begins on October 12, 2016.